SL Mascot: Where does my Avatar go when I am offline? OK - before any helpful soul tells me that my avatar disappears when I go offline - I KNOW. The question is rhetorical... it is there to be slightly controversial, and to make a point. As I have already blogged, I am occasionally going into SL via the SLeek. This is a text-only interface; good for IM and Chat, but leaves the user completely in the dark when it comes to "seeing" where your avatar is standing. It is like being blind - but more-so as you don't have any other senses to work with either! So, during a session with SLeek, you could arrive in-world with your avatar stood on someone's head. Equally, you could have a crowd of people stood on top of your avatar's head and you'd never know. My answer to this is to find a "safe spot" to stand when I exit SL. Then, if I log in using SLeek, I know exactly where my avatar is standing, and am confident that there is no-one else stood on top of me. 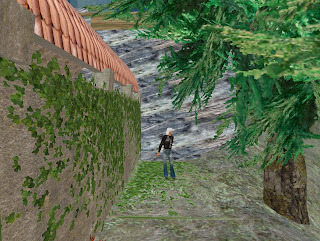 Now, as I don't own any land of my own, I have been using a friend's property in SL as my "safe spot". I TP to their house, walk outside, and stand in a secluded spot in their back-yard. Every time I have done this, there has been no-one home, so I have not needed to mention to the owner that I've been passing through their house. Which brings me to the serious point of this discussion.... even though logically I know my avatar is not really there (lurking in the bushes in my friend's back-yard), Emotionally, and irrationally, I still find it hard to accept. The immersive experience of the 3D world has left me feeling that my avatar is a real character, who is still there in SL when I log off. I guess it is a bit like the feeling that people have about "being molested" whilst Camping.... (apparently there are some people who will animate their avatars to perform lewd acts with avatars that have been left "camping" in nightclubs). 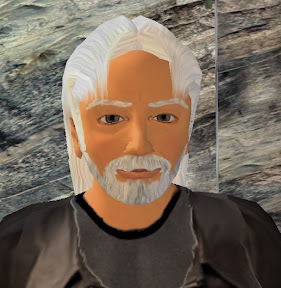 I mean, why get upset about an avatar.... it is just a computer generated image.... and if you are camping, you are not there to see what is going on!..... but equally, why get uneasy about standing in someone's back yard as you exit SL????? Clearly there is more going on that meets the eye. People get attached to their avatars, and the avatars take on something of a life of their own... so, perhaps, the trick will be in tapping into this emotional bond with avatars in order to develop the "killer app" for 3D worlds. Oh well., privacy is important in SL too, so, i added a few security systems which provide several functions, they are free and one is under 200L, whenever someone who is not in a whitelist that came around my house, it will auto eject the person's home..
Whats the purpose of walls and windows or lockable doors if privacy is disregard? Of cause, i don't mind if my friends crawling my place when i am offline, but, no strangers of cause..
As for when we offline, our avatar is gone as well, thus, no avatar parking for offline needed, unless you are using a bot, lol..